This is a wonderful book!! 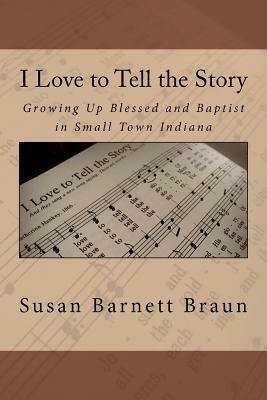 The very talented author, Susan Barnett Braun, has written a memoir about her childhood years growing up in southern Indiana. I grew up in a small town not far from hers. I related in many ways to her upbringing and not only because we grew up in similar surroundings but I also had a religious upbringing. Because of my upbringing, like Susan I always took the time to think about the consequences of my actions and whether it was the right or wrong thing to do.Susan writes about her concerns with her appearance and I certainly could relate to that!! I also cared about my appearance and was especially sensitive about my early height (5'6" starting 6th grade), my unruly hair, crooked teeth, and acne problems. I, too, took music lessons and started playing an instrument in 5th grade so I could be in the high school band.I smiled and laughed out loud a lot at Susan's tremendous wit throughout the book especially when she talked about baton twirling. I also wanted to twirl but had no baton so I used an old broom stick for a couple of years until I could get a real baton. There was no money for twirling lessons but my dad took me to visit a man he knew who had been a drum major at IU many years before. I was shown some twirls that I practiced religiously.I loved the words of hymns at the beginning of each chapter because they set the tone for the message Susan wrote about. It was obvious how important faith and family were and still are in her life. Susan writes in such a way that any age would enjoy this book. I hope she will continue writing about her life and that she starts where this charming book left off. I plan to read more of her books. I highly recommend I Love to Tell the Story with 5 very bright Stars! Many memoirs stress the misery in which the author grew up. "Girls In White Dresses" blogger, Susan Barnett Braun, gives hope to parents trying to raise happy, normal children while still being a believing Christian. Susan and I grew up in similar towns in the same years--in fact my Dad once sold products to her Dad for his ice cream business! We didn't meet, however, until blogging. She grew up in the John Mellancamp's fabled "Small Town"--Seymour, Indiana. This is the sort of town where a beloved school bus driver's funeral (and my best friend's Mom) brings out hundreds and the police officer directing traffic at the cemetery has tears running down his face. No, it's not Mayberry--there are meth and oxy addicts, illegal immigrants and run-of-the-mill redneck pot heads too, but most folks mow their grass, pay their taxes and work hard. Even Emril was surprised by the manners many children showed when he served lunch at an elementary school there a few years back. "Yes ma'am" is not at all uncommon.For Susan, growing up as the daughter of a public school principal, in a family of Mom, Dad and three girls in a Brady Bunch style home, life was good. And life was centered on First Baptist Church. Yes, you read that right. She went to PUBLIC School (later taught in one, too!) and grew up BAPTIST. It happened all the time before what we know as the "religious right" took over. Her life is way, way more typical of growing up in America than the Glass Castle or There Are Now Children Here and the like. Not rich, not poor. They had "enough" and gave thanks for it.Susan's memories are often overlap with my own--similar experiences at school, similar toys, tv shows, etc. Like another book I reviewed her story is a sort of epiphany. Those of us who grew up in suburban tract homes, attending decent schools, taking private clarinet lessons, singing "Love is Like A Magic Penny" at V.B.S. (it didn't matter which Church, you just went for the fun), who put on a Girl Scout uniform on Tuesdays and crammed in the back of Mrs. Leader's station wagon to go to a church hall and learn to crochet--we no longer have to hang our heads in shame. And ditto those who did NOT become drug addicts, or go to prison or whatever to find the Lord. Some folks grow up with that security and need not apologize for it.I Love To Tell The Story ties a hymn to each chapters remin1scences--weaving Baptist fully into the life of a growing girl. Right now it's available for Kindle or Kindle for PC, a free download for any PC that let's you enjoy Kindle books on your computer.This is a GREAT choice for Church book clubs, for 45--55-ers nostalgic for their childhoods and for anyone who likes to read a positive, uplifting life story.I hope a major Christian publisher will soon pick this up. I also hope Christian women's magazines, Guideposts and others will soon be knocking on Susan's door. This book deserves real attention.I Love to Tell the Story by Susan Barnett Braun. I recently finished fellow blogger Susan Barnett Braun’s memoir I Love To Tell The Story. The storyline follows Susan’s developing faith throughout her childhood, but without any “preachy” tone; instead, you’ll chuckle over pleasant anecdotes about her favorite toys, hobbies, peer group issues, and fashions of the day that all tie into her young wonderings about God and faith. I could relate to the humorous memories she recounts of life in a quiet midwestern town as a conservative Baptist kid. I too grew up in Baptist churches, and her child’s-eye view brought back my summers in VBS, or how I wondered what happened under the water during baptism (or if the pastor would drop me!). Susan’s writing is straightforward with descriptive similes and visual passages especially delightful for their foray into the culture of the 70s. Best of all, this book is a positive look at life as a Christian kid, which is refreshing (not everyone ends up bitter!)! A quick read you can pick up on paperback or your Kindle reader! I just finished reading “I Love to Tell the Story” by Susan Braun. I came from a similar upbringing as Susan, so most of the items I related to. In a world full of books that can be inappropriate for small children or even teenagers, it is refreshing to see one that you don’t have to worry about what the kids are filling their minds with! This book is equally as good of a read for those of us that are older. It brought back many fond memories of my childhood, and caused me to look at my upbringing from an entirely different view than before reading this book. Especially refreshing is the ways it is written. As I was reading, it felt like Susan and I were talking over a cup of hot tea, and her sharing stories of her childhood and upbringing. I would heartily recommend this book for all ages! This is a sweet book! It's a funny coming of age sort of book. I enjoyed it because the main character is 5 years young than I am and I can relate to so much of the era, however I wasn't raised in a Baptist church...... Another thing I really enjoyed, there was a hymn at the beginning of every chapter. I remembered most of them, probably from when I belonged to that Baptist church when I grew up.